Like the title sais: club staff (especially younger staff) should be able tochange their favoured formations over time after spending a long time at a club playing a certain way. I find it very unrealistic that this should be a static trait, when apparently Arsene Wenger at the age of 68 according to FM changed his preferred formation from 4-2-3-1 to 5-2-3 wb wide over the course of a year. I have a few questions regarding whether or not staff actually see an improvement to attributes other than for example training attributes relevant for coaching assignments? for example: do young scouts improve their JCA/JPA? Is there any way to affect this, for example hiring a 25 year old scout with decent JCA/JPA and wait for him to improve? Also, is it possible to affect staff members favoured formations? I will upload as soon as i can, i can also add that this bug only occurs when the wide CB's have personalised instructions, regardless if you use the personalised instruction or not. As you can see in the image above my tactical analysis tool of weaknesses on the pitch is incorrectly showing weaknesses in front of my two wide centre backs saying that "there is no centre back selcted in the area where it should be"
There is no way to affect what roles players will have in youth teams. 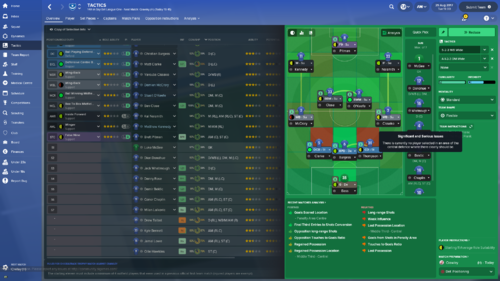 I have tried creating and saving a specific formation containing the desired roles for each position, but it doesnt appear in the drop down menu for selecting formation in staff responsibilities for u23 team. I have also tried giving each player in my youth teams personalised instructions, but they get overwritten as soon as i appoint a manager for the u23s. This is a massive flaw, since it does not give any possibility to affect development of young players in your team, leaving us with the only option to take control of all teams ourselves, which is both very unrealistic and very time-consuming. This seems to occur after an autosave (for me at least), and is removed when i restart the game. So for now people might wanna try manually saving until this is fixed. Columns added to the various scouting pages ("scouted" and "player search") keep reseting when progressing. As the title states, one of my players lost 3 steps of his suitability as a winger during ONE click of progressing, although he is always playing as a winger and has winger set as his focus. has anyone else experienced this, and if so do you have any clues on why this happens? As the title sais, i've asked the board for feeder club recommendations to send out players on loan for work permits. The recommendations are all in bulgaria and im trying to decide between two candidates. One of them is an amateur club not currently in a league and the other one is a proffessional club in a low league but with 1 step worse training facilities than the other one. What would you suggest i prioritise; higher division or better training facilities? I cant seem to find the english youth leagues (u18/u21) when i search for divisions in the editor. Can anyone help me find them, since i am trying to create u18/u21-teams for a club and then add them to said leagues? Since the premier league will introduce promotion and relegation between the youth divisions from the 14/15 season on, i was wondering how this is arrange in the game? does anyone have an idea? im having the same problem. I followed the instructions for dealing with crash dumps and it was fine for a while but a few hours later it came back. Is this related to the patch and if so, is it possible to "downgrade" my client to the previous version somehow? as the title sais i'm having a problem with my youth team managers not using the starting line-ups i set for the youth teams, this results in that the players i wish to develop/give match fitness doesnt get game time. does anyone know how i can fix this?